Our collaboration sour beer with Crane Brewing Company, Mango Lassi, arrived a couple weeks ago. We’re biased and obviously love it, but from what we’re hearing at the stores - you guys like it too! We’ve gotten several messages asking if it is still in stock. We will still have it for a little while, but it’s heading out the door at a steady pace. We’re offering a 10% discount on a case (12 bottles) and 20% off growler fills on Mondays! So if you already got enough bottles, but want even more mango for drinking, come grab some on tap at any of our stores. Remember, this beer is exclusive to Mike’s (and Crane) so you won’t find it anywhere else! If you missed the beer the first time, or haven’t tried it yet, I highly recommend it. Crane’s awesome base-berliner weisse is paired with lactose, vanilla beans and mangos in a tangy nod to the popular mango/yogurt-based drink, the mango lassi. Berliner Weisse is sour wheat ale originating from Germany. Low in ABV and bitterness, this tart style is becoming more popular than ever before. And I feel okay speaking for the staff of Mike’s in saying that the style is a staff-favorite too! This is a larger piece for me, about 20x30 inches, on a wood panel. 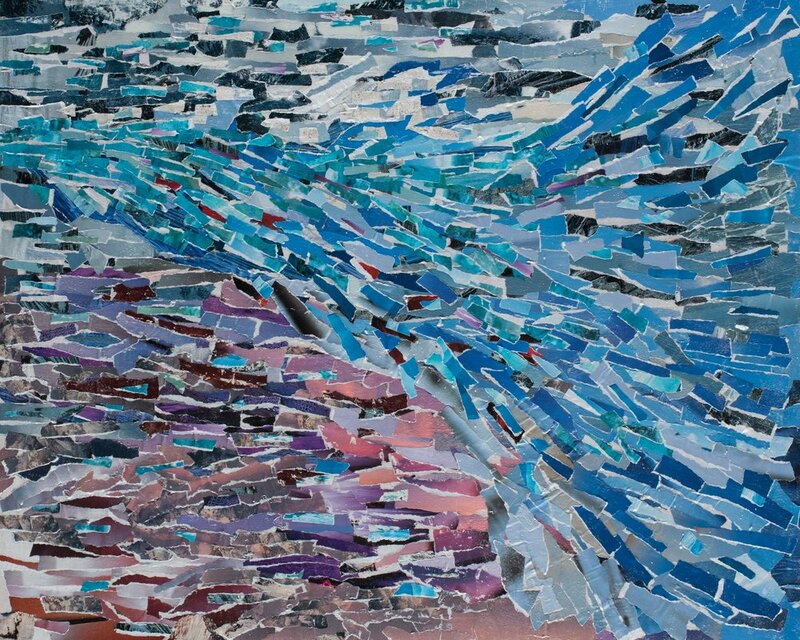 The image was created by gluing down torn strips of photographs from National Geographic magazines. While I majored in Printmaking in college, this style of mixed-media collage was something I dabbled with on the side as an outlet from the stringent process-based world of screen printing. I enjoy the similarities to impressionist brush work that it can create. Once the original was finished, it was photographed by Chris Mullins and submitted to Crane for the addition of their standard label layout. From there they sent a copy back to me, to make sure I was okay with the layout. I sent it back with my approval, and they then submitted it to the state for label approval….whew! It turns out there are a lot of steps to even put together a beer label! Thanks for your support, come grab some Mango Lassi, and stay tuned for news on some other collabs we have in the works!